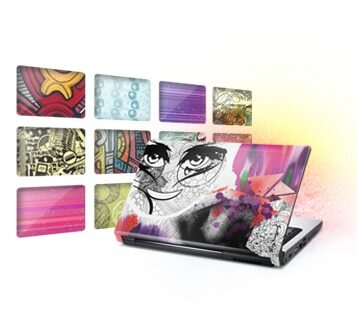 Get creative and stay connected with the Dell StudioTM 15 laptop. Its Hi-def, 15.6" LED widescreen design is multimedia-rich, and with a choice of colors the Dell StudioTM 15 is easily personalized to fit your style. 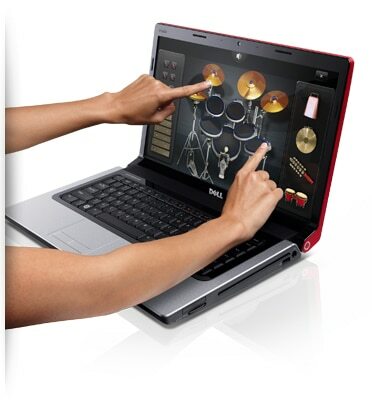 Your unique style has met its match with the DellTM Studio 15 laptop. The personalization begins with a choice of 5 rich colors and over 200 unique images. 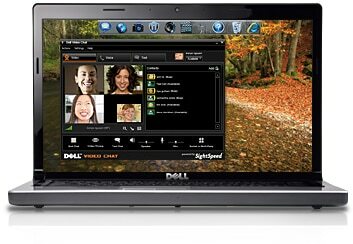 And when designing the Dell Studio 15, Dell was listening to you — and in return your ears will be amazed by the surround sound audio, including a subwoofer for intense listening. It doesn’t stop there, take advantage of a range of performance options, wireless and graphics solutions, plus the Hi-def LED display is standard. So go ahead, express yourself on your terms. Make it yours with a choice of colors or a distinctive, etched pattern, complete with custom accents. Quickly locate your touch applications and access all your media content in a touch-friendly way. Have fun with your photos. Pinch, zoom, and rotate photos with the touch of a finger. Once you’re finished, simply flick to post them online to share with family and friends. Listen and create music playlists, leave notes for family members or browse the web using multi-touch. Turn your screen into a canvas with the easy-to-learn painting application – an experience your whole family can enjoy. Connect with your online world with touch enabled webcam software. Plus, capture and slide your video to YouTube. Discover outstanding picture and surround-sound quality with Blu-ray DiscTM , which features almost 6x the picture resolution of DVD, plus interactive menus, games and movie features. 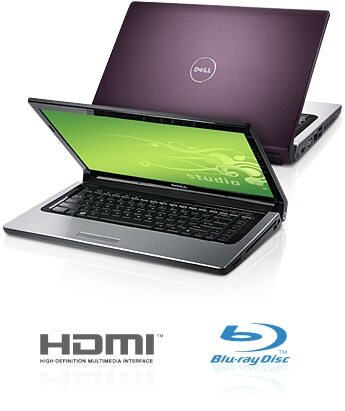 With its HDMI port, you can enjoy the high-def experience on your TV by using your laptop as your Blu-ray Disc player. Immerse yourself with available theater-style surround sound audio and a subwoofer for incredible sound quality. Fill your 16:9 aspect ratio 15.6¨ HD LCD screen with your favorite HD movies. 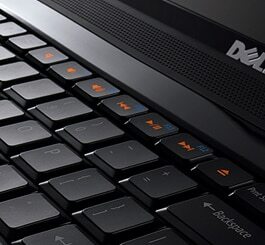 Choose from integrated graphics or optional 1GB ATI discrete graphics for a premium multimedia experience. Get high-speed connectivity wherever you have cell phone service with a range of optional mobile broadband* connections. 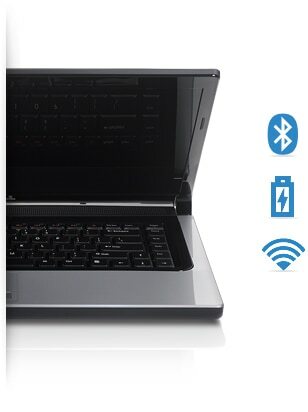 With optional Bluetooth you can easily connect wirelessly to compatible keyboards, cameras, phones, mice and more. The Studio 15 laptop is packed with the latest processor technology from Intel® CoreTM i5 Dual Core and i7 Quad-Core processors. When compared to the previous CoreTM 2 Duo generation of processors, the Intel® CoreTM i7 Quad-Core series performance has increased up to 137%. A Dell PC powered by the Intel® CoreTM i3 processor delivers a fast, responsive experience so you can do the things you love. Features smart multitasking with Intel® Hyperthreading Technology that allows you to work on two tasks at the same time. Keep clutter at bay with Dell Dock, and stay connected with family and friends with Dell Video Chat. Enjoy a cleaner desktop with the Dell Dock. Installed software applications on your PC are automatically sorted into user-friendly categories, placing frequently used programs front and center. Keep up with family and friends using video chat, record and send video emails, or make PC-to-PC phone calls around the world. (Internet connection required) The application also supports four-way calling1 , making virtual family reunions a reality. Gain secure and convenient access to your content by simply using the optional facial recognition software.